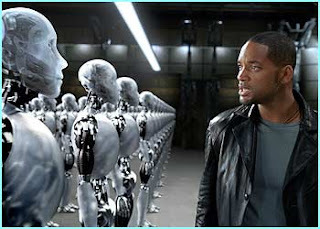 I,Robot takes place in the future, where most people own a personal robot to help out with daily life. The movie, starring Will Smith, is based on Isaac Asimov’s similarly titled book. During one of the discussions Will Smith (Detective Spooner) has with Dr. Landing’s posthumous recordings, the doctor explains that the end of these laws, even though they are perfect, is Revolution. Why? Why can’t we guarantee our safety? Will we ever phase out the risks of daily life? The answer is: Life will always be risky. For this reason postmodernism, which says “live and let live,” is useless. Just “living” and “being safe” are insufficient purposes for living. God designed us for more than just surviving. In any case, safety is an illusion. The only way to endure the daily struggles of living is through courage and tenacious faith. Logic is harmless, but daily life is inherently illogical. The only thing that balances out illogical evil is illogical good. Sunny, the only robot designed with a heart described the greater masses of his peers as “slaves of logic.” Sunny could lead his peers because he was designed to be something besides a slave. Such is the handicapping effect of postmodernism that the phrase, “This is for your own protection,” can be used to justify anything. Viki justified her oppression of mankind with the supposition that she would guarantee the survival of mankind. But people were created for more than just survival. This is why the prospect of being locked in our homes for the rest of our lives “for our own safety” is repugnant to us. Interesting. One of the things that this brings to mind is that Christianity at it's core calls us to an life of great risk and adventure... The taming of Christianity is a real perversion of what Christianity is. I'd like to quibble a bit around some of your terminology, though. I think you'd be hard-pressed to find any post modern who defines post modernity as "live and let live"
I often identify myself as a Christian and a post-modern. I'm careful as I do this because both these terms mean so many different things to so many different people. The way that most folks who oppose post-modernity define the term, who in their right mind would want to be one? For that matter, the way that many people define the term Christian, who'd want to take on that label? I'd go along with the basic idea that many forms of relativism boil down to "live and let live" and that "I, Robot" has some interesting things to say about the relativist world view. youre right, Jeff, i forgot one of the benefits of postmodernism, which is, many posternists seem to desire something realness and relevancy, especially when it comes to spirituality, this is why they call themselves "postmodern"